There are many different wedding insurance policies out there, of which Asian Wedding Insurance is just one. With so many policies to choose from you may have found it difficult to find the one that meets your needs. In order to help you buy the insurance that is right for your wedding we've put together some things to think about while making your decision. Cancellation cover - Most wedding insurance policies work with cover levels that reflect the total amount you would be able to claim in the event of your wedding being cancelled due to an insured reason. To ensure that you are not left out of pocket you should choose the cancellation cover that is closest to the overall cost of your wedding, including any celebrations before your actual wedding. If you aren't sure of the total cost of your wedding and associated events, click here to use our handy wedding cost calculator. If you find at a later date that you need to increase the level of cancellation cover, you can pay to upgrade your Asian Wedding Insurance policy to a higher cover level by calling us on 01483 562 662. Number of Events - While it's important to have the right level of cancellation cover to protect your wedding celebrations, you should also check to make sure that your policy covers multiple events. Most standard wedding insurance policies, including our own Dreamsaver wedding insurance, only cover a wedding and a reception. 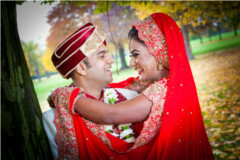 Asian wedding insurance covers up to 6 wedding related celebrations as standard, therefore if you are having more than just the standard western wedding, it makes sense to have them covered. Something else you might want to check on your policy is the period of cover; some policies require the wedding and reception to be on the same day. Asian wedding insurance allows for a period of 94 days in-between the first event and the final event of your wedding celebrations. Deposits paid before taking out cover - Check before buying your insurance policy to see if it includes cover for any deposits you have paid prior to buying it. Some cheaper policies do exclude this, potentially leaving you unable to recover these costs if you have to claim. Asian wedding insurance includes cover for deposits that have been paid prior to purchasing the policy; that way you have peace of mind should the worst happen. Please note: this element of cover comes into force 14 days after the policy has been purchased. Adverse Weather - Given the unpredictable nature of the UK weather it makes sense to ensure that your policy includes cover in case you have to cancel due to adverse weather. On most policies this cover will only come into force once a certain amount of time has elapsed after purchasing the policy (on Asian Wedding Insurance this is 14 days), so make sure you buy your wedding policy in good time for your first celebration. While this is probably more relevant if you are getting married during the winter months, given how unpredictable the weather can be in the UK, it is a good idea to check your policy has cover for this eventuality whatever time of the year you are getting married. Public Liability - liability cover is there in case your venue or a third party sues you due to your accidental damage to property or a person. On some policies this is referred to as personal liability. Some venues may require guests attending the wedding and reception to also have public liability cover in place, so check that your policy can be extended to cover your guests. Like the majority of other wedding insurance policies, under the Asian Wedding insurance policy only the bride and groom have liability cover as standard, however cover can be extended to include all your guests by paying an additional premium. The standard Asian wedding insurance liability cover is £2 million; however, some venues may ask for a higher limit, so this can be extended to £5 million for an additional premium. You should check with your venue regarding the limit of indemnity they require. If you have bought a wedding insurance policy that does not allow liability cover to be extended to your guests then Asian wedding insurance also offers a stand-alone public liability policy that will cover the bride, groom and all of the guests up to £5 million. We hope that these tips help you find the cover that is appropriate for your wedding celebrations, so that you can look forward to them with peace of mind. Click here to compare cover levels across all Asian wedding insurance policies. Copyright © 2014 Voyager Insurance Services Ltd. All rights reserved.